Dr. Nan Boss graduated from the University of Illinois School of Veterinary Medicine in 1985, and has owned Best Friends Veterinary Center since 1993. At that time it was called Grafton Small Animal Hospital and it was in a different building than the one we are in now. We moved into our current building in 2003. Dr. Boss started writing handouts and newsletters shortly after graduating from veterinary school. She eventually put them together into sets for puppies, kittens, adult dogs and cats and senior pets. Her notebook system is now used by practices all over the United States, Canada and Europe. Her strong interest in client education also led to writing her book for veterinary staff members, “Educating Your Clients from A to Z: What to Say and How to Say it.” This book is currently in its second edition and is a top seller for the American Animal Hospital Association. It is also required reading for AVMA accredited technician training programs. Her breed-specific wellness materials are also published, as are the training materials used to train the BFVC team. The training program here at Best Friends Veterinary Center is the envy of clinics across the U.S. and results in staff members who are willing and able to answer just about any question a pet owner may have. Dr. Boss is actively involved in several veterinary organizations and also does a lot of writing and speaking for the veterinary profession, on topics such as client education, team training and medical record keeping. 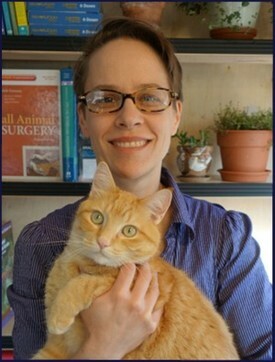 She is the author of four veterinary books, as well as several volumes of handouts on wellness and medical topics for clients, which are used in practices all over the U.S. and in several other countries. She believes that these extracurricular activities helps keep her, and everyone else in the practice, up to date in the medical care we offer. Dr. Boss is very active in organized veterinary medicine, having served on numerous boards and committees at local, state and national levels. She has done consulting for veterinary-related corporations and works with the veterinary students at UWM in Madison for both AAHA and Vet Partners, a veterinary professional organization. One of Dr. Boss’s special interests is canine rehabilitation. She attended the first training program in the country for rehabilitation in pets, through the veterinary college at the University of Tennessee. Her training makes her one of the first veterinarians in the state to provide this special care. Throughout her career, Dr. Boss has maintained a strong focus on customer service and excellence in patient care. Always willing to go the extra mile for her patients, she’ll consult with a specialist or research difficult cases and likes to do second opinion consultations, work up challenging medical cases and tackle new surgical techniques. She works very hard to continuously improve the quality of care delivered to both clients and patients in the hospital. 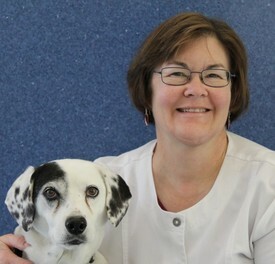 Dr. Boss also enjoys gardening both at home and at the practice, working on her retirement property near Baraboo and spending time with her dog Izzie, a beagle mix. She and her husband, Bob, also have three cats. 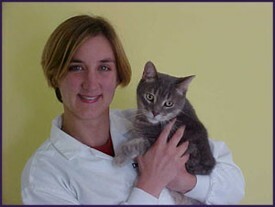 Dr. Elisa Horsch has been working at Best Friends Veterinary Center since July of 2004. She loves her clients, patients, and co-workers! Dr. Horsch's husband, Dana Pionek, is a large animal veterinarian at the veterinary clinic in Cedar Grove. Dr. Horsch worked here full time until 2008, when her first son David was born. She gave birth to a second son, Isaac, in July of 2010. She is back to full time now that her boys are in school. Dr. Horsch was born in California, spent her early childhood in Saskatoon, Saskatchewan and grew up in St. Louis. She attended Hendrix College in Arkansas, and moved to Madison, Wisconsin for Veterinary School. She now lives in Port Washington with Dana, David, Isaac, her dogs Genie and Charlie, and her cat Gracie. In her spare time, Dr. Horsch loves spending time with friends and family, gardening, cooking (and eating! ), reading, sports, and travel. Here at Best Friends, she enjoys working with her clients to provide their pets with the best preventative care available. She has special interests in dermatology, internal medicine and feline medicine. Dr. Wilder, who usually goes by Dr. Paige, graduated from the University of Wisconsin Madison School of Veterinary Medicine in 2014. She joined the BFVC team in March of 2015. Her special Interests are client education, behavior, internal medicine and preventative care. Paige's personal interests include vegetable and perennial gardening, sports and exercise (roller derby, kettlebell workouts), reading historical fiction and thrillers, traveling overseas (future destinations include New Zealand and Iceland) and geeking out over geology and social/cultural criticism. (The rest of us aren't really sure what that is.) She and her long-time partner, Markus, split their time between her home in Port Washington and his in Madison.